When I got my first DSLR (the Nikon D200) I had to decide on a Quick Release system to go with. After much research I decided on the Arca Swiss system, which is probably the most popular QR system. I now have a few Arca Swiss compatible QR plates, clamps, and heads. The idea is that you attach an arca-swiss compatible QR plate to your camera (and anything else you might want to attach to your arca-swiss compatible tripod head). 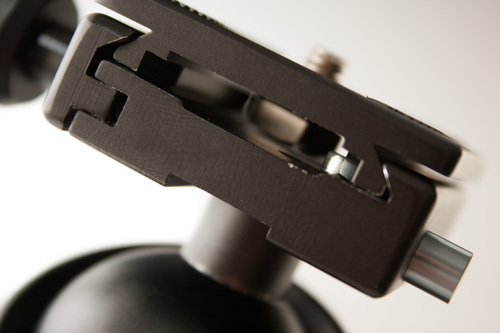 Then the camera can easily slip into the tripod head clamp and be removed easily as well. Very useful if you often switch between handheld and tripod shooting. For tripod heads that don't have arca-swiss compatible clamps, you can purchase the clamps separately and attach them to the heads. 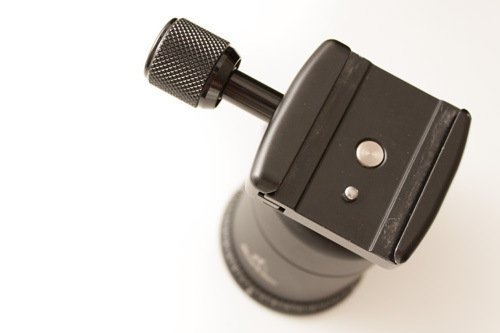 I have an arca-swiss compatible clamp on my pano head, and also on my macro focusing rails. But despite all my clamps and plates being sold as Arca Swiss compatible , they are not all compatible with each other. The main issue is the use of locking pins on the heads / clamps. 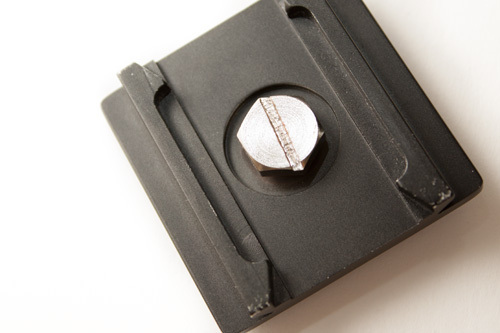 These are small pins that are designed to hold the plate in in place, so that if you accidentally start opening the clamp without holding onto your camera, the camera won't slip out of the clamp and crash to the ground. The above photo shows my KS-1 no-name ball head, which has a small metal locking pin. 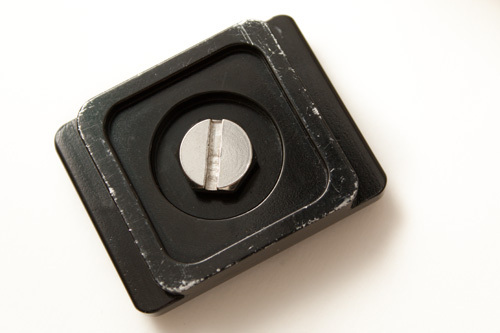 Below is the bottom of a standard arca-swiss compatible quick release plate. The plate slides into the clamp on the ball head, and the (spring loaded) locking pin of the ball head grips into the indent on the QR plate rail. This secures the plate so it won't come loose when the clamp isn't tightened fully. The KS-1 ball head has a plunger attached to the locking pin, so this can be pushed in to move the locking pin out into the central 'channel' of the plate. This allows the plate to be quickly and easily removed without having to fully loosen the clamp. The clamp I bought for my pano head has a bottom-spring loaded pin in around the same position as the KS-1 ball head. This locks the plate in place okay, but there is no way to retract or move the pin, so removing the plate requires fully undoing the clamp. Not quite as convenient, but not a big problem. My Markins ball head has a bottom spring-loaded pin, which is located in the centre of the clamp 'channel'. This means that it secures the camera in one direction only. The pin will stop the plate from falling out of the loosened clamp because it is in the way of the screw at the bottom of the plate. Now the real problem with these locking or safety pins comes when you get an arca-swiss compatible quick release plate that has a solid edge. 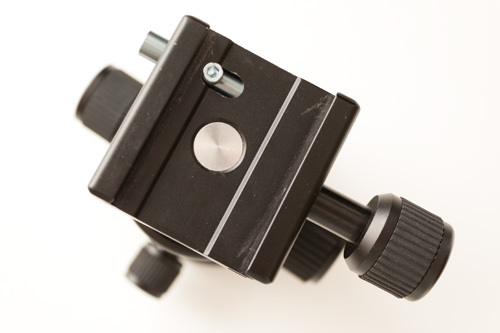 With the KS-1 ball head, there is no way to properly mount a quick release plate like this on the head. The best you can do is sliding it up to the locking pin, and then tightening the clamp with the plate not fully centred in the clamp. In theory you should be able to loosen the clamp fully, and then slide the QR plate in at an angle to mount it properly. But the clamp on the KS-1 ball head does not open far enough to allow this. 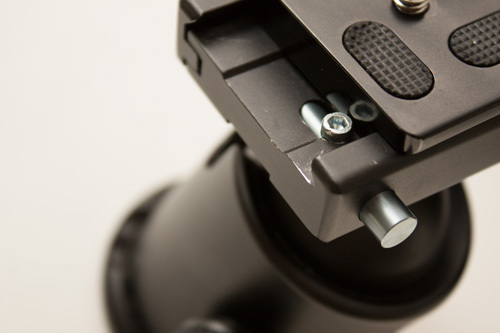 The Markins ball head has the same issue in mounting and unmounting the quick release plates with solid edges. However, the clamp on the Markins does open wide enough to allow slipping the plates in at an angle to mount them properly. But this is not quite so convenient. The solution to this is simply to remove the locking pin from the clamp. 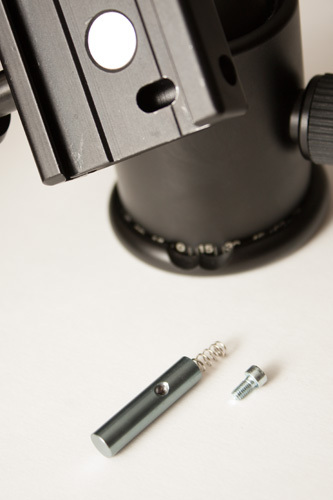 The KS-1 ball head has a small hex indent in the top of the locking pin. So it can be unscrewed using an allen key of the correct size. 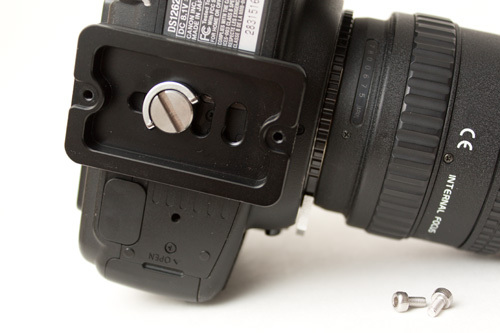 The clamp I used on my pano head has a small screw at the bottom of the clamp underneath the locking pin. This can be unscrewed to release the locking pin. The Markins head has a similar arrangement, but with a hex-type screw head on the bottom. UPDATE November 2012 - I had a nasty accident with my camera falling out of a quick release clamp that I had removed the locking pin from. I would now suggest that rather than removing the locking pin, it is better to just be careful about what clamps and plates you buy. Ensure that they will be compatible with your existing clamps and plates before purchasing. Then there will be no need to remove the locking pin, and you can save yourself from the same accident I had. Another issue I had was with an arca-swiss compatible quick release plate I purchased recently. This was sold as a PU60 plate, which it seems is designed for use with the Benro B2 ball head. The problem with this plate was that it has a screw at either end of the plate that extends down below the height of the plate. This meant I couldn't mount it on any of my arca-swiss compatible clamps / heads. It looks like the Benro ball head for which the plate is designed has a deeper central channel in the clamp that can accommodate these screws. One of my arca-swiss compatible quick release plates is slightly smaller in terms of the width of the rails that fit into the clamp. The clamp on my KS-1 ball head does not tighten far enough to clamp securely onto this plate. So, if you are looking at buying into the arca-swiss compatible quick release system, you should make sure that any plates, clamps, heads etc. really are compatible with each other. Otherwise be prepared to remove the safety locking pins to allow compatibility. (Which isn't too difficult really). Thanks for this helpful, illustrated write-up. I have the same KS-1 ball head and ran into the same issue with a Kirk lens collar with built-in arca-swiss quick-release plate. I had to remove the locking pin on the ball head, but just one of the two protruding bottom screws on the plate. That should work pretty well. The plate is long so when mounted snug to the protruding screw it has to go quite a distance before releasing. Thank you for this discussion. Currently I am struggling with the same issue. I am not ready to use a mounting plate that will fall off if the clamp becomes loose. Consequently am thinking of modifying an available plate, not a very good solution if you don’t have allot of time, but one solution. More specifically File or cut a slot in the outer rim on the bottom that will allow the pin to pass when it is depressed.. See the last picture.